Such a wise reflection: that in spite of our best efforts we won’t ever be free of pain. I’m sorry you have to struggle so through all this, but from one try-harder to another, thank you for your insight. 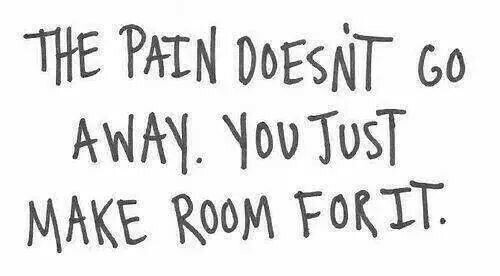 Here’s to making room so pain can rattle around where it doesn’t hurt any one. Thank you for this beautiful post. It’s an encouragement to hear another traveler in pain put into such beautiful words your similar journey. It was also helpful for me to feel like I could write my feelings, as I wait for surgery tomorrow and a diagnosis of the type of Inflammatory Arthritis… with my old Fibro. LORD, please give me the grace to accept this new pain. What a blessing Stephanie – thank you for sharing these words of wisdom and your journey with us. The Lord is definitely using you and your trials to comfort others. Oh my goodness Steph! This is an incredible piece! 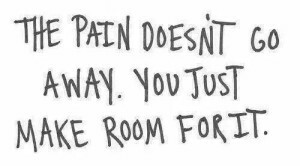 I hope and pray my Lisa will see it…she can certainly relate and it will help her deal as you do with daily , relentless pain. Thanks for another great insight and encouragement to so many! Love you bunches honey!